Rio Grande Village is an interesting corner of the park, definitely worth a visit after the Window or Lost Mine day hikes. (Since you need to hike those in the morning to avoid the heat, you should have half a day left.) The "village" is just a collection of park facilities, not a real town. But it's on the Rio Grande River (right). White water rafting trips take out and put in here when the river has enough water to make the trips possible. 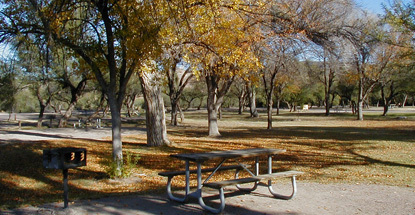 Usually, this is during late Winter and early Spring, not in the Summer when we're at Big Bend. The best campground in the park is here at Rio Grande Village (above right). It's beautiful, level, with shade and grass. This is the only campground in the park with showers, since it's right on the river and has plenty of water. But, as you'll notice in the photo above right, it's empty in June. This is because temperatures hover at 120 degree range during Summer months. When a breeze picks up, it just makes it worse, because it blows hot air. If you're coming down during the cooler months, you have to phone two months ahead to get a campsite. Otherwise, forget it. However, after a few nights camping up in The Basin, you'll want to take advantage of the showers. They're coin operated, but there's a store where you can get change. You can also pick up a soft drink and ice cream sandwich before heading back to The Basin. However, while you're here, there are some other things to check out. One of these is Big Bend's very own Hot Springs. They actually had a resort down here. There was a hotel, bathhouse and restaurant. They became very prosperous, but competition from Hot Springs, Arkansas was too great. The old buildings are still there. If you have a 15 passenger van, truck or jeep, you can very slowly and carefully drive over. If not, you can hike the three miles. Cars lack the needed clearance. 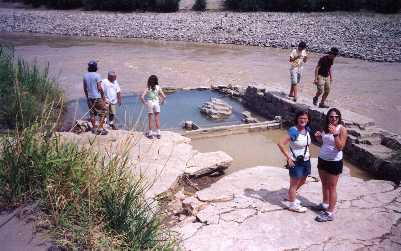 Two of the old pools are still there, right along the river, and you can sit in them (top left). But the enclosing walls have eroded over half a century, and today at high water the river fills them up. If the national parks are ever again properly funded, new enclosures, much higher and more sanitary, able to meet health department standards, could be built. The empty buildings could be restored, the road improved, and this could become a legitimate attraction. One of the big attractions here was always the Mexican village of Boquillas (left), which has no electricity, running water or road access. Residents take mules out a steep and winding trail through the Chihauaha Mountains. 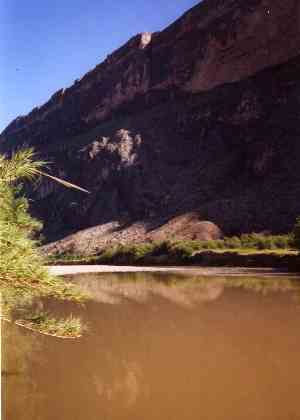 For all of the 20th Century, a ferry (actually only a rowboat) operated between Rio Grande Village and Boquillas across the bend visible at the bottom of the photograph. Then you took a mule to the town and back to the river. It cost a few dollars for the boat across and a few more for the mule. Arriving in the town square, the wrangler ties your mule's reins to the hitching rack in front of the Cantina. Going over for a day to eat at the Cantina and shop for hand made blankets, pottery and jewelry was part of every Big Bend trip. With the immigration, drug and weapons smuggling controversies in the last decade, this ferry was shut down and access to Bouquillas all but shut off. This is a shame, since it is an almost perfectly preserved 1850s settlement. From several hiking trails on the U.S. side of the river, you can use a powerful pair of binoculars to study it, like looking back in time. In the Summer, the Rio Grande water flow drops (this is a desert, remember), and you can wade the river waist deep. 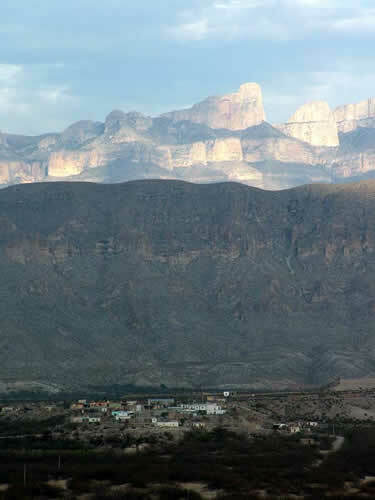 So theoretically, if you really wanted to visit Boquillas, you could do it pretty easily. But it's now illegal, and you might find yourself confronted by the Border Patrol when you tried to come back across. There are several hiking trails leading out from Rio Grande Village, if you can handle the heat. 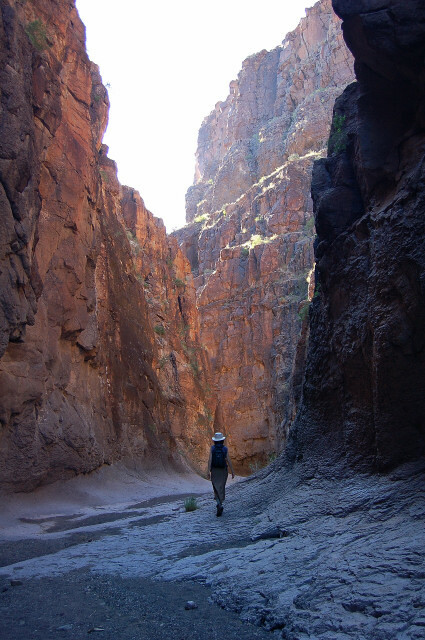 Many of them are short and lead to spectacular views of one of the canyons either above or below Rio Grande Village as the river carves its path. There are several overnight trips you can take. The most historically interesting uses three other trails to get you East of the village to what is now called Telephone Canyon. It was formerly called Silver Canyon and is the location of one of Texas' most famous episodes. When it won its independence from Mexico and declared itself a republic, it needed to coin its own currency. There were silver mines across the river around Boquillas. Texas was mining the silver, transporting it by mule train out to Fort Stockton, then on to Fort Worth, where they operated a mint. The Cavendish Gang began ambushing the silver shipments as they came through the canyon. So in one of their first missions,Texas dispatched a unit of Texas Rangers to accompany the silver. They were ambushed and killed. A Commanche brave came upon the scene and found one Ranger, Frank Striker, still alive, so he carried him to his village, where they nursed him back to health. While recovering, Striker discovered a wild stallion trapped in one of the side canyons and tamed it. Fully aware of the symbolism, Striker cast several thousand bullets from Boquillas silver and used them the rest of his life. When he was fully recovered, he, the stallion and the Commanche tracked down the Cavendish gang one by one and either killed them or brought them in for trial. This story became The Legend Of The Last Ranger, which became a novel, several movies, a tv series, and a comic book. There is a plaque in the canyon which goes into more detail. If you go, you must carry water. In the Summer, the creek is dry. The immediate vacinity of Rio Grande Village is not the only reason for this sidetrip. On the way down and back, you'll see some of the most spectacular geology in America. 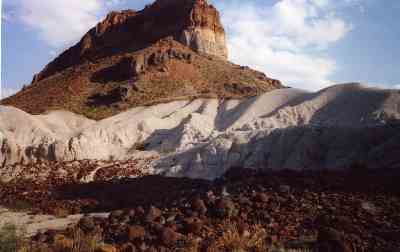 It is a land of volcanic eruptions and other geologic processes. Drive slow and plan on stopping at least several times for some great photos. On the way back, notice that some of the scenes you passed on the way down now look totally different. As the sun moves across the sky, especially as it begins to drop late in the afternoon, the colors continually change and shadows highlight different features. Also watch carefully for wildlife. This is the least visited part of the least visited park in the nation, and there are a surprising amount of birds, snakes, lizards and mammals who have found a way to survive and prosper out here. They lay low in the heat of mid day, but as evening approaches they start moving around. Also notice some of the bizarre plants growing out here, not only cacti but others which have learned to store water and thrive in the bright sun.